Here is an action you can do from anywhere in the world. 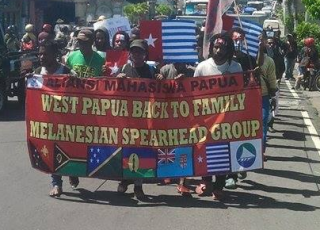 Please forward this sample letter to your government representative, asking them to support West Papua joining the Melanesian Spearhead Group. Please send the letter ASAP, in time for the Melanesian Spearhead Group (MSG) meeting 17-26 June. You will need to add a brief introduction to your Member of Parliament in the body of your email explaining why you support the Free West Papua Campaign and say you would like them to take Benny Wenda’s proposed action in the letter. “I want to bring to your attention, and ask you to please take urgent action, on the issue of West Papua’s self-determination. This week is a milestone for the colonised nation of West Papua, as they await a decision from the leaders of the Melanesian Spearhead Group as to whether their application to join this pacific trade and cultural region body has been accepted. This decision will take place 18-26 June in Solomon Islands. The Free West Papua campaign is appealing to International MPs in advance of the decision to use their diplomatic weight to lobby leaders of the MSG. If you would be willing to consider doing so and wish to know more about what you can do please refer to the attached letter from Benny Wenda, a West Papuan representative twice nominated for the Nobel peace prize. I urge you to please use your power to bring about justice and raise awareness of this situation.